I mistook the first nene I ever encountered for a Canada goose, but who can blame me? The bird was leaving a line of droppings in the Kilauea Point National Wildlife Refuge in Kauai, Hawaii. It looked familiar but wrong, somehow, with skinny toes, black painted plumage and a fluffy white neck. “Good nene!” called out a ranger at the admissions booth, as if speaking to a sweet but dim-witted child. One nene had eaten a berry off a shrub at the entrance to the wildlife refuge. Everyone turned to look, and it paused, seeming to acknowledge the positive reinforcement. Then it honked, and I was six years old again, feeding the Canada geese on Mont Royal’s Lac Beaver. Fall in Montréal meant the end of Canada goose season. I climbed the stairs to Lac Beaver to feed the stragglers bits of bread. I watched them cross the pond, already littered with red and yellow maple leaves. They always came just close enough to snap up the treat but stayed too far away to touch. I knew they went south during the winter to get warm, like my grandmother. If my memory could have stretched back another 500,000 years, I might have been able to reconcile my country’s eponymous travelling water bird with the strange breed of goose now honking at my feet. That’s the time frame within which ornithologists believe the Canada goose first came to Hawaii and began to evolve. DNA tests performed by the Genetics Program at the Smithsonian Institution’s National Museum of Natural History have shown that the large Canada goose is the closest living relative of the nene — an evolutionary tale that spans an ocean and half a century. Why some of those original Canada geese stayed behind and how quickly they gave rise to the nene are subject to speculation. I think back to the nene I followed around that day across the wildlife refuge, as it waddled to its nest under a bush, and realize that bird would not exist but for an accidental migration. At some point in the last half-million years, some Canada geese were blown off course — and landed, as if by a miracle, some 6,500 kilometres away on the islands, mere specks in the sea. I close my eyes and imagine that maiden voyage. It is perhaps not a surprise that some geese decided to stay in Hawaii, rather than fly home again. Today, the northern pintail still flies in and back to places like Saskatchewan each year. For every bird to survive that exhausting passage, I wonder about those that do not. In the 1770s, when Captain James Cook first visited the Hawaiian archipelago, the nene was a common sight. By the 1950s, fewer than 30 remained; hunting and destruction of their wetland habitat had pushed them to the brink of extinction. Conservationist Sir Peter Scott brought half the birds to England in the early 1950s to propagate them in captivity. 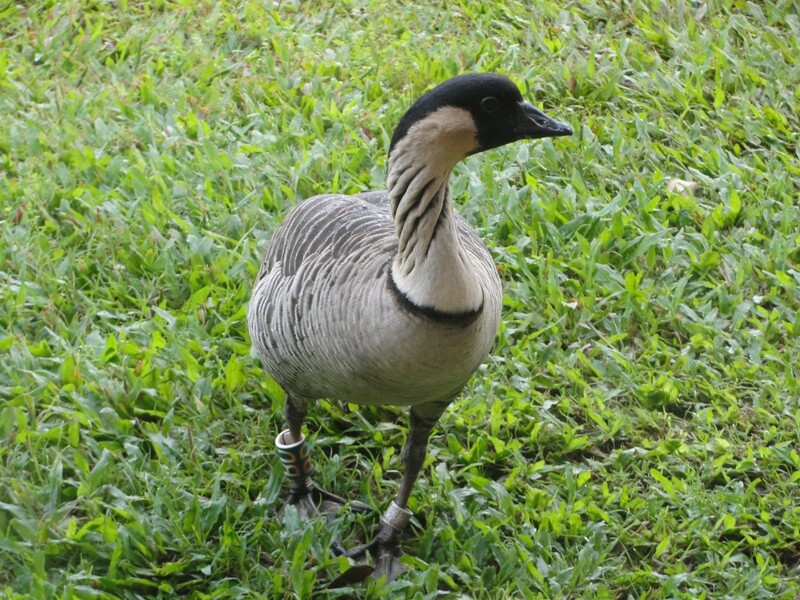 The Hawaiian government did the same, and today, the nene number almost 2,000 — still critically endangered, but creeping toward recovery. That the world’s rarest goose (Branta sandvicensis) evolved from North America’s most ubiquitous goose is one of life’s little ironies, but it’s not the only one. Hawaii has spent millions of dollars to cultivate the nene; cities in North America spend millions of dollars gassing and shooting Canada geese. The nene is the sacred state bird of Hawaii; one British newspaper dubbed the Canada goose “one of Britain’s most hated birds.” Canada geese annoy farmers by eating their crops and create airplane hazards, such as the flock of Canada geese that nearly took down a United Airways flight in 2009, forcing the pilot to splashland the plane on the Hudson River in New York City. Worst of all is their poop, befouling soccer fields and cars, public parks and estuaries. I remember visiting Boston’s Brandeis Unversity in high school on a tour of American universities. Canada geese were there, and their droppings were so thick on the ground, they looked like snowmelt. The last thing I expected in Hawaii was to rediscover the goose of my childhood, a few thousand generations removed and very far from home. Now when I hear that familiar honking overhead, I look for the V-formation and wonder where they’re going next. Julia Scott is a San Francisco-based journalist who flies home to Montréal in the summer, when it’s warm. 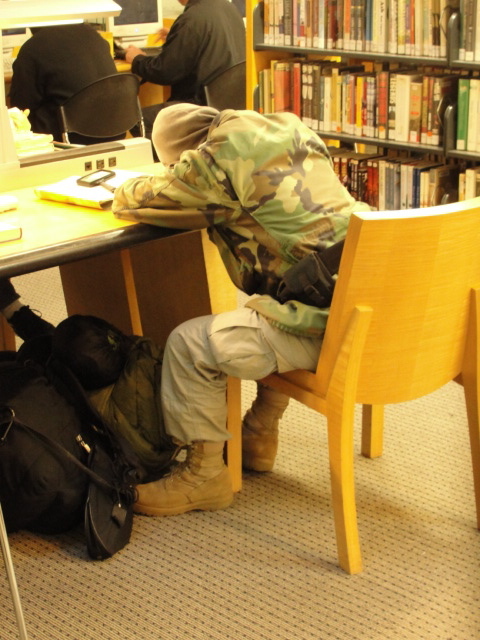 HOST: Step into pretty much any city library in America, and you’ll find all kinds of people in the stacks — students, retirees, and the poor and homeless. Libraries aren’t just for books or movies anymore. Increasingly, they’re a place to turn for job skills, shelter — and now, some social services for people who have nowhere else to go. JULIA SCOTT: A few years ago, the San Francisco Public Library started seeing a flood of homeless people — sleeping in the study areas and washing up in the bathrooms. David LaFleur was one of them. DAVID LAFLEUR: I used to be one of the people who used to pretty much keep their hygiene up here in the restroom, you know? You gotta wash your face, you gotta brush your teeth. LaFleur is 51, and he’s been homeless for six years. These days he’s living in a group home with a dry and sober program. But he still uses the library’s computers every day to look for a job. LAFLEUR: Let me get my resume — these are some of the jobs that I was applying for yesterday through Craigslist. This is a driver warehouse position. Main Branch librarians found they had nothing to offer LaFleur and other people who came in asking for help. So, three years ago, the library hired the first social worker in the country based out of a library. Her name is Leah Esguerra. LEAH ESGUERRA: What I’ve learned from being here is that the library’s goal is to include everybody, to make the library accessible for everybody, and not to screen anybody out. Other libraries have added social workers, too. That’s because city libraries find themselves on the front lines of the national recession. Lisa Gieskes is coordinator for the Housing, Homelessness and Poverty Task Force at the American Library Association. LISA GIESKES: Libraries are a public service and the communities that we serve are dealing with a poverty rate of over 15 percent, according to the last U.S. Census. Gieskes says for newly unemployed Americans, just having access to the Internet is a big deal. In recent years libraries have added job skill centers and resume tutoring, too. GIESKES: You can actually see spikes in library usage with the recession because people know that we provide a free service. Not just free books, but free programs. In North Carolina, Brigitte Blanton runs something called the “Winter Series” for the Greensboro Public Library. It all started a few years ago when the library invited homeless folks to eat inside to get them in out of the rain. Then, they asked their homeless patrons what else they needed. The answers were a little surprising. BRIGITTE BLANTON: We were like, oh great! We can do job and career counseling, we can teach them how to use the Internet. But some of them were trying to find out where they could sleep that night. So the library started meeting people’s basic needs. It got nurses from a local university to do blood pressure screenings. A dentist donated dental kits. It did haircuts, too. BLANTON: And you’re saying, it takes a haircut. Where are they going to get the funds for a haircut? We take those things sometimes for granted. Libraries, of course, face major budget cuts. Some have lost funding even as they start to add programs for homeless people like David LaFleur. LAFLEUR: We’re constantly fighting for resources, and to make sure that these resources don’t get cut off. Pretty much that’s where I’m at — fighting for my life on a constant basis. The library is still a place to come for answers. That’s why David LaFleur will be back tomorrow.